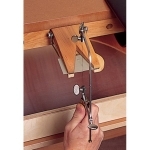 The Bench Pin Saw Vise is the perfect tool for holding metal wood or plastic for easy sawing. A necessity for the jeweler's bench as well as for the hobbyist or craft person. Fits in standard bench slot or clamps on table. Powerful spring and non-slip jaws grip metal from 32 to 4 gauge. Quick release and self-adjusting.